Most people, if asked, will say they want a leader they identify with and who understands and celebrates their identity. But how this relationship gets worked out in practice is immensely complex because human identity--especially racial identity--is complex and contested. To think critically about how leaders can influence discussions of race and racism through their own rhetoric and policy ideas. To learn about the ways in which these ancient ideas have been used in the modern world to promote a specific type of culture called “western civilization"
Meet the module creator, Rebecca Kennedy! What does it take to be (or become) truly American? The election of an American president is a unique opportunity every four years for a nation to reflect on its highest values and what it considers its best character. It's a chance to think about what makes a people, and their leader, "great." For some, like white-supremacist Richard Spencer and those who follow him, greatness is inextricably tied to the genetic makeup of some Americans and their supposedly all-white Christian heritage. For others American greatness is embodied in sometimes specific, sometimes vaguer cultural norms that are felt to be slipping away, creating an anxiety for the future. For still others (though these groups probably overlap) greatness is tied to the cultural construct of "Western Civilization", which itself has a genetic underpinning. While the use of classical images and texts to support narratives of white supremacy and racism has increased in its visibility in the last year, there has not been a time since the 19th century when this has not been happening. This has put increased pressure on many in the field of Classics to engage with the questions of race and ethnicity in the ancient sources as well as the reception of these topics in the modern world in a way they had not before. In antiquity, however, there seems to have been more fluidity in how groups of peoples were identified, at least in terms of the variety of terms used to talk about what we call race and ethnicity today. Terms like the Greek genos, ethnos, phyllae and the Latin gens, tribus, and natio can all actually be translated as either “race” or “ethnicity”. But what these terms mean is the focus of much discussion. Importantly, however, studying the ancient texts and archaeology makes it pretty clear that what we call “race” and “ethnicity” are not natural categories, but constructed. For the Greeks and Romans it was much the same. How were "race" and "ethnicity" constructed in the ancient world? 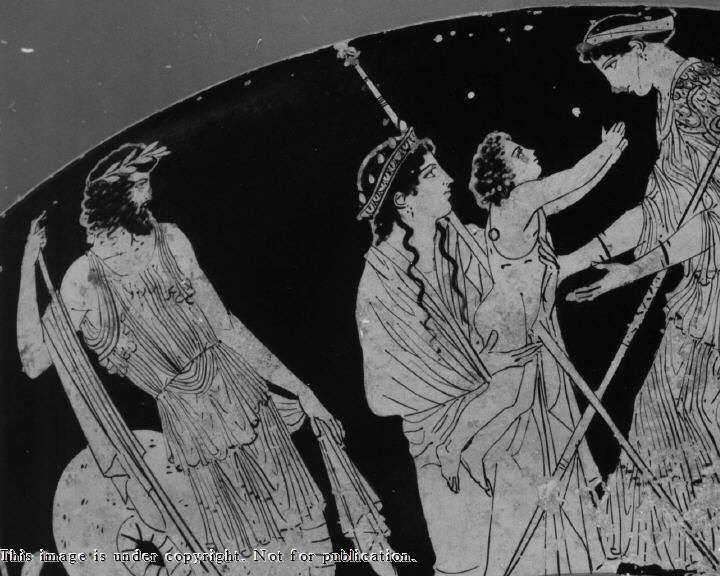 For the Classical Greeks of the 5th century BCE, especially the Athenians and Spartans, one became Greek by being born Greek and also by sharing a language, religion, and cultural traditions. For the Hellenistic Greeks things were more flexible: as Alexander the Great and his armies conquered much of Asia, they established Greek cities throughout where the Greek language was spoken and Greek-style building were built. The Greeks themselves also adapted many traditions and practices of the peoples they conquered while also intermarrying. The Romans had an even more elastic definition of race/ethnicity. To be a Roman meant to be a Roman citizen, whether one was Roman, Sabine, Etruscan, Latin, Greek, Syrian, Egyptian, or one of the other myriads of peoples the Romans came into contact with and incorporated into their empire either through enslavement, territorial expansion, or military recruitment. Rome covered three continents and imported slaves from all of them and from beyond their own borders. In fact, the children of freed slaves became Roman citizens making the population of Rome one of the most diverse ever. Additionally, over the centuries, Roman emperors made mass grants of citizenship to parts of its empire culminating in the grant of Roman citizenship to every free person in its entire empire in 212 CE. This decision came from the leader of the Roman world, sending a message that all peoples of the empire--regardless of their physical or cultural differences--were Roman. What do you expect your leaders to know about race? Can you identify one leader who has shaped the way you yourself think about and discuss racism? If so, how? Have you ever heard a leader reference the Greco-Roman past or the "Western Tradition" as a way of thinking about American identity? How did this leader believe this past impacted American identity? How would you imagine understanding the similarities and differences between ancient and modern notions of human differences could inform and even change the way we talk about race and racism today? What is “Western Civilization”? Is it a "thing"? Generally, western civilization is a term given to set of cultural norms and traditions of beliefs, political systems, and intellectual and artistic traditions of European origin that are practiced in Europe and other nation of European origin . It is highly likely that, if you went to school in the United States, you had textbooks in your history, literature, or art classes about “western civilization” or the “western canon” or “western traditions”. “Western civilization” is primarily linked by three elements: Christianity (though some say Judeo-Christian in order to recognize the Jewish origins of the “Old Testament”, an artistic and literary tradition claiming roots in Classical antiquity, and whiteness as a racial identifier. These elements are said to bind together nations in Europe, North America, and Australia and New Zealand, all of which claim their origins in European colonization. The United States, in particular, has often also been called the “Leader of the West” or “Leader of the Free World”, in which “free” and “west” are used as synonyms, and this rhetoric of “the West” and “western civilization” permeate our political as well as popular culture, even in how we fantasize about other worlds--think of Aragon’s big speech in the fantasy Lord of the Rings: Return of the King where he refers to his troops as “Men of the West”. Throughout the Lord of the Rings (books and films), the Men of Gondor and those whom Aragorn and Gandalf and the Elves represent are structured as the West, with a specific set of traditions and beliefs, mirroring the cultural assumptions of its author, JRR Tolkien, and the filmmakers. Those who write and publish their work often shape the way we view the world and may be seen as leaders in that sense, whether or not they hold political titles. In the following to texts, see if you can’t discern what the writers or speakers mean by the term “western civilization”? What makes "the West" civilized? Where might we see the overlaying of “free” and “west”? If the “west” is “free”, what is the “east”? Who are the considered the members of "the West"? What evidence do you have for your impressions? Is there any evidence for someone to conclude that "the West" is partly a racial construct? The first article is an opinion piece from the New York Times by writer David Brooks. Brooks is a long time proponent of classical education as the foundation of a strong, Enlightenment-based “western” society, a society he now sees “in crisis”. The language of “western civilization” has increased over the course of the last year, especially among the political leadership of the Republican party, including Rep. Steve King’s remarks about western civilization and immigration and, most importantly, President Trump, who gave a speech in Warsaw, Poland ahead of the 2017 G-20 meeting in Hamburg, Germany, which is being viewed by some as a triumph for “western civilization” as a concept and by others as a triumph of white supremacy. REQUIRED: Trump Speaks in Poland, July 6, 2017: read it or watch it. If something called “western civilization” exits, is there also an “eastern civilization”? Interestingly, there does not seem to be a monolithic concept of “eastern civilization” to mirror “western civilization”, though there is a concept of “East” to go with “West”. Historically, this division between East and West has had a long and changing existence. We might see its genuine origins in the division of the Roman Empire into Eastern and Western halves in the 4th century CE, which the became a de facto division between two branches of Christianity--Catholic and Orthodox. Are East and West the same and “civilized” and “barbarian”? The East/West divide is often said to be found in the Persian Wars, a series of battles fought in 490 BCE and then in 480-479 BCE between an alliance of Greeks and the armies of Persia. Three particular battles--Marathon (490 BCE), Thermopylae (480 BCE), and Salamis (480 BCE)--are most often cited as representative of the conflict. Edward Said claims that the concept of Orientalism--the exoticization of non-European-American cultures in representations by European-Americans, linked frequently to colonialist or imperialist contexts--had its origins in ancient Greece. Of course, the “Eastern” Persians were the imperialists, not the Greeks in the ancient context, and yet the use of the Persian Wars rhetoric of the classical Athenians in particular is clear in Orientalizing texts, images, and films. A clear example of this is the film 300, where the representation of Xerxes is fully exoticized and demonized. The author of the original graphic novel and the director both have suggested the representation is truthful to the ancient texts, but they are not. Such representations also underscore a notion that all non-European-American peoples or those who are not part of “western civilization” are “barbarians”, a term coined by the ancient Greeks to refer to any peoples who did not speak Greek and used by Romans to refer to northern European peoples like the Gauls and Germans who did not live in settled cities or have extensive political or economic systems. Modern associations with the term “barbarian” are more closely aligned with the Roman view, though those people designated barbarians by the Romans are, ironically, the ones who have most frequently used the Greek meaning of the term to designate anyone not “western”, i.e. not white, Christian, and of European descent. 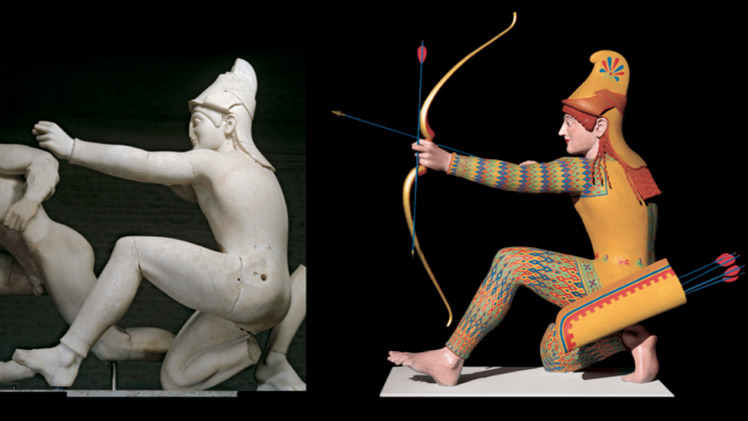 In the 19th and early 20th centuries, even the Greeks themselves were depicted by northern European artists as an orientalized, eastern “other”--a projection onto another of negative stereotypes that one considers the opposite of what they themselves are or should be. How then, could they be the foundation of a western civilization? Below are readings from ancient Greek and Roman sources on the Persians (in Greek source) and Parthians (in a Roman source). See if you can’t identify in each source where the dynamics of racism or ethnocentrism may be at play. If you can’t identify any explicitly racist elements, that is fine--sometimes the racism is in the interpretation and not in the actual source. If this is the case, see if you can’t identify how these sources might be or were used to construct this modern notion of the “barbarian” eastern other that underscores the concept of western civilization and white supremacy narratives. Based on your new understanding of race and ethnicity in the ancient world, imagine you now a presidential candidate at a prime-time debate, with all of America watching. Write down a 30-second response to each of the following questions. Time yourself to make sure you are under 30 seconds. Is American greatness based in Western Civilization? Please answer 'yes' or 'no' and explain your answer. As president, would you promote and defend the values and ideals of Western Civilization against all who would oppose them? How would you talk to someone whom you see as racist (or who has racist views) but does not see himself/herself as racist? How would you use your presidency to overcome the racial divides in this country? Ask a friend or family member to review your responses and explain how they might be received by a national American audience. Now imagine that you are at a dinner party with five or six undecided voters who probably don't agree entirely with your views (whatever they happen to be). Pick a question from the five above that seems most interesting to you. How do you think you could have a constructive conversation with these voters? Everything below is considered extra credit or "deeper cuts" into notions of "western civilization" as derived from the ancient Mediterranean world. It might also constitute a second week on the topic of race and racism in the course of Ancient Leadership in the Era of Donald Trump. Christopher Krebs, "A Dangerous Book: the Reception of the Germania"
Did the ancients have a concept of connecting skin tone to racial/ethnic identity? Environmental determinism, which uses climate to account for differences in skin color, is the closest, but it doesn’t necessarily have the meaning that we attach to color--they associate whiteness with women and the feminine or with certain diseases. 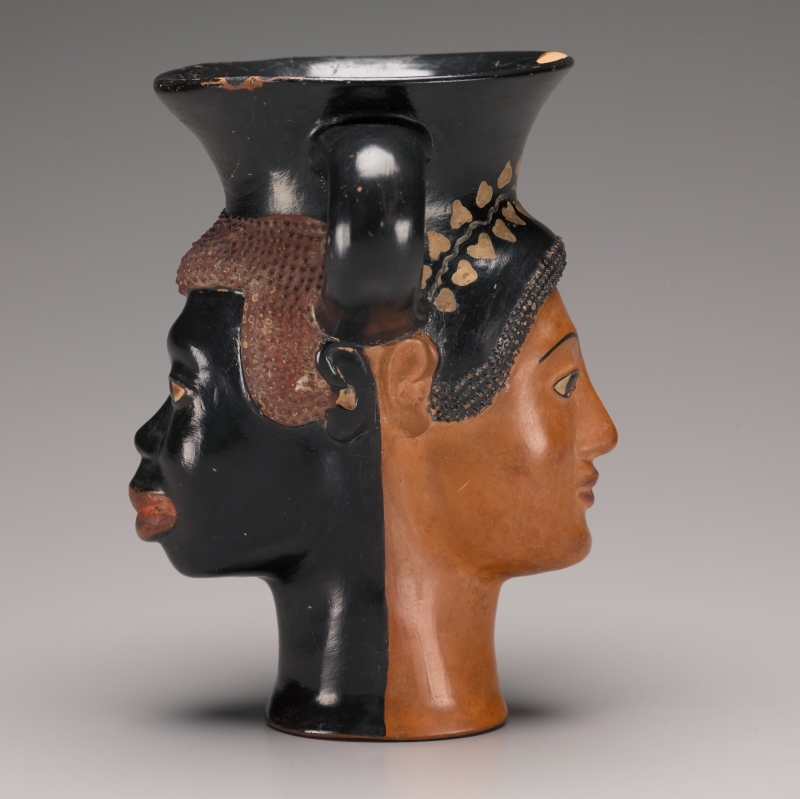 If skin color was not an indicator of “race” in antiquity, how did they differentiate peoples? And if skin color is not a historical way of differentiating peoples, why do American rely on it so heavily? Read James Dee "Black Odysseus, White Caesar: When Did 'White People' Become 'White'?" Short, in class writing reflection on how student “identify” and why they identify in these ways. Using the attached geographic descriptions, have students use the readings on Environmental Determinism to draw the people that would live in these climates according to the descriptions. It is best to use crayons based on the range of colors. This should be done in small groups (2-3). Find and bring in for discussion a contemporary or modern “reception” of these ancient approaches to race and ethnicity. Group ethnography project--pick a student organization/sports team and do an ethnography, describing the group's shared identity--physical characteristics, dining habit, clothing, religious beliefs, dating habits, or other “outstanding” characteristics as modeled in the ancient texts. Work with your university/local museum or an image database to explore images from a variety of cultures and examine how they are presented to the public. Conduct further research into any of the materials in the module and create a poster or paper on that research.